The Hollis Prism 2 rebreather is to make its first UK appearance at the EUROTEK 2018 event, which takes place on 1st and 2nd December in Birmingham. Although popular with divers around the world, this unit has only just been given CE marking for sale in European countries – including the UK and Ireland. The Prism 2 is an electronically or manually controlled, constant PO2, modular, closed circuit diving system. It is designed for deep water, cave and expedition level diving in cold and demanding environments. This unit has a user-packed, radial 5.5lb CO2 scrubber. The scrubber canister is mounted vertically on the backplate and between twin supply cylinders (one each, oxygen and diluent). In due course customers will be able to specify their Prism 2 with either front mounted or back mounted counter lungs. These are fitted with both automatic and manual gas addition systems and a variable volume control valve (only on FMCL version) that is used upon ascent to vent excess expanding gas volume or to purge the loop. Diluent addition is automatically achieved as hydrostatic pressure increases and the counter lung collapses against the valve actuator. Prism also features an industry low Work of Breathing of 0.94 J/L – Tested at 100M by ANSTI. The electronics are controlled through a Shearwater Petrel. With the electronics switched on, the secondary also provides a status check for the battery and displays the set point selected for the dive along with other critical information. The electronics vote between the three proprietary galvanic sensors and control the operation of a low wattage solenoid valve on the oxygen supply. 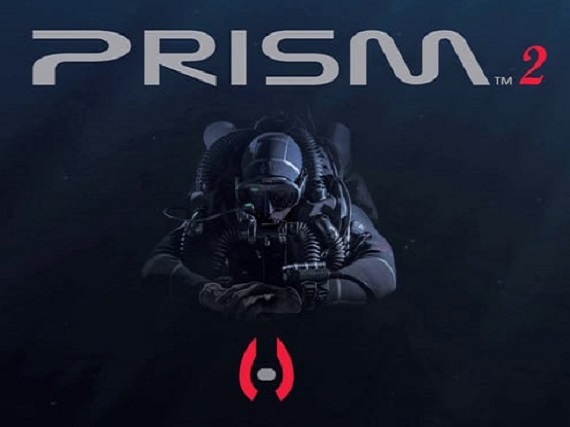 Hollis will be at the EUROTEK technical diving conference this weekend to demonstrate the Prism 2. You can follow the dedicated Hollis Rebreathers UK page on Facebook.